This is the fourth in a series of stories compiled by Special Olympics Missouri to highlight those people within the organization who are doing great things. The Special Olympics Missourian of the Month will highlight an athlete, coach, family or volunteer who the SOMO staff members believe embody what the mission is all about. This month, the KC Metro Area has singled out coach Amanda Geno of Lee’s Summit as the January Special Olympics Missourian of the Month. Fitting in can sometimes be troublesome, especially if people think they don’t have any shared commonalities. Therein lie a potential difficulty in growing the Unified Partners® program in Special Olympics Missouri – but only if the focus is on peoples’ differences instead of their similarities. Unified Sports® is an inclusive program that pairs individuals with intellectual disabilities (SOMO athletes) and individuals without IDs (partners) on sports teams for training and competition in 21 Olympic-type sports divisioned by age and ability. Amanda Geno, left, accepts an award from Kansas City Metro Area Regional Development Director Kami Delameter. It might seem like growing such a program would be difficult, but only if someone focuses on the differences. It doesn’t take too long, however, to see there are many more similarities between our athletes and our Unified Partners than differences. If there’s one person who could be considered the poster girl for ignoring the differences and highlighting the similarities between athletes and UPs, it’s UP and Lee’s Summit Police Officer Amanda Geno. Geno, 29, is one of them. As a UP, she’s considered a Special Olympics athlete – and her fellow athletes love her. Selken, 23, and Geno have been partners for a little more than a year in softball and bowling. Selken has already taken a liking to Geno, mainly because of her authenticity. Geno said the experience of being a UP is what you make of it. “It’s hard to decide what I most enjoy as a UP,” Geno said. “ Sometimes I laugh until I cry and sometimes they laugh out loud at me when I trip over the ball return or do something goofy. I also enjoy how excited they are to see me and are always quick to ask how my weekend was or how I’ve been. 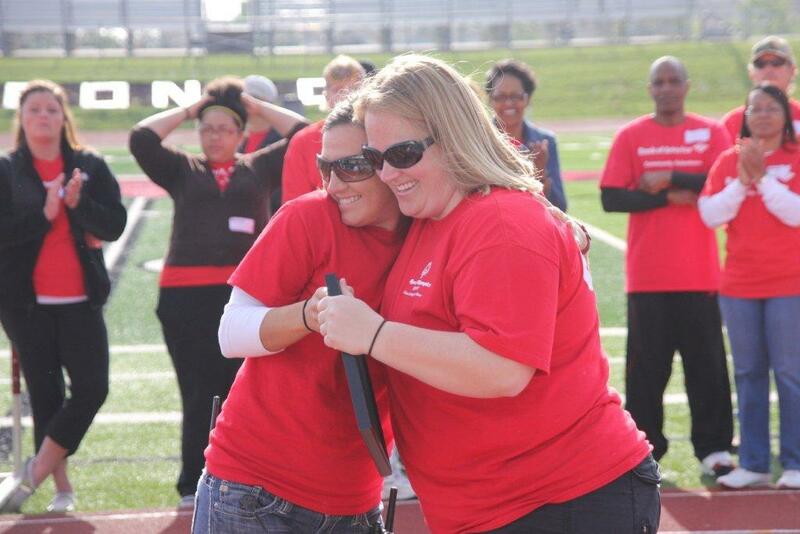 Geno first became involved with Special Olympics in 2002 after selecting her college sorority based on its already-existing relationship with Special Olympics. She went on to help a Special Olympics wheelchair slalom team practice with her college cross country team. Following college, Geno became a police officer and joined the Law Enforcement Torch Run®, which helped further the cause in Geno’s eyes. “It’s almost like it was meant to be!” she said. In the past few years, Geno has gone out of her way to become more involved with SOMO. Fellow Lee’s Summit police officer Mark Wiesemann said Geno has been pushing to do more with the LETR. 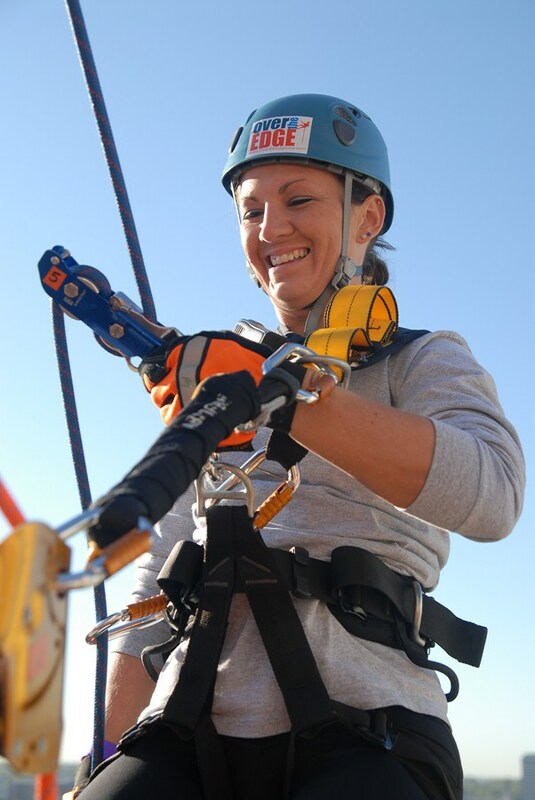 Geno takes pride in not just competing and volunteering for SOMO athletes, but fundraising for them as well as is seen in this photo of her taking part in the Over the Edge fundraiser. Kami Delameter, regional development director for SOMO, said Geno is the embodiment for what LETR is all about. “Amanda is a wonderful representation of our partnership with law enforcement,” Delameter said. “She has embraced SOMO in all aspects – torch runner, Plunge committee member, (Games Management Team) member and general event-day volunteer. Geno said she wanted to serve on the games management teams because she can be the voice of the athletes and make sure they are heard in the planning of events in and around the KC Metro Area events. Coach Webb said this push to become immersed in the behind-the-scenes aspect of SOMO is what makes Geno so invaluable. In June 2013, Geno took part in SOMO’s USA Games Selection Camp at the Missouri Military Academy in Mexico, Mo. She qualified for the bowling team and will compete alongside fellow athlete Tiffany Wright at the 2014 USA Games, June 14-21, in New Jersey. 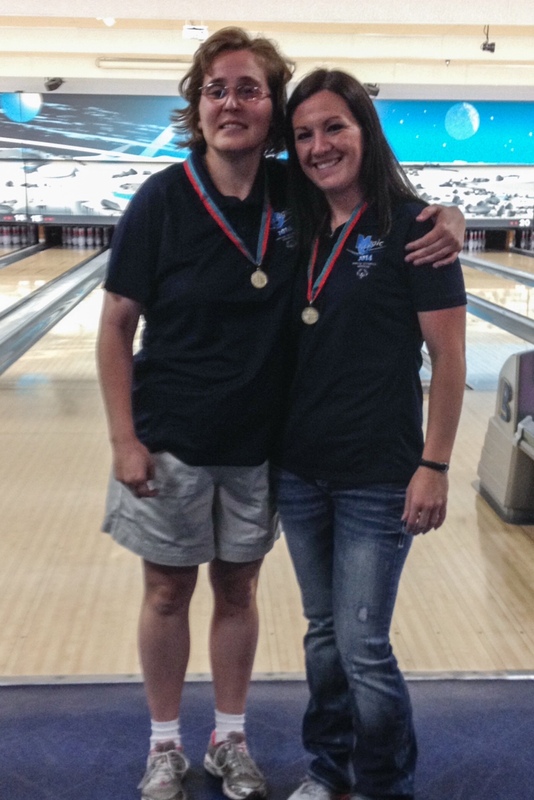 Geno, right, poses for a photo with SOMO athlete Tanya Johnson after they received a gold medal at a local bowling competition. This will be the first time Geno will compete at a national level for Special Olympics Missouri and it’s safe to say she’s a little excited about the opportunity. “I’m learning as I go, and I’m pretty sure I’m just as excited as the athletes,” Geno said. “I’m proud to be their voice if they need it, their shoulder to cry on when things get tough and an encouraging voice when they are having a bad game. 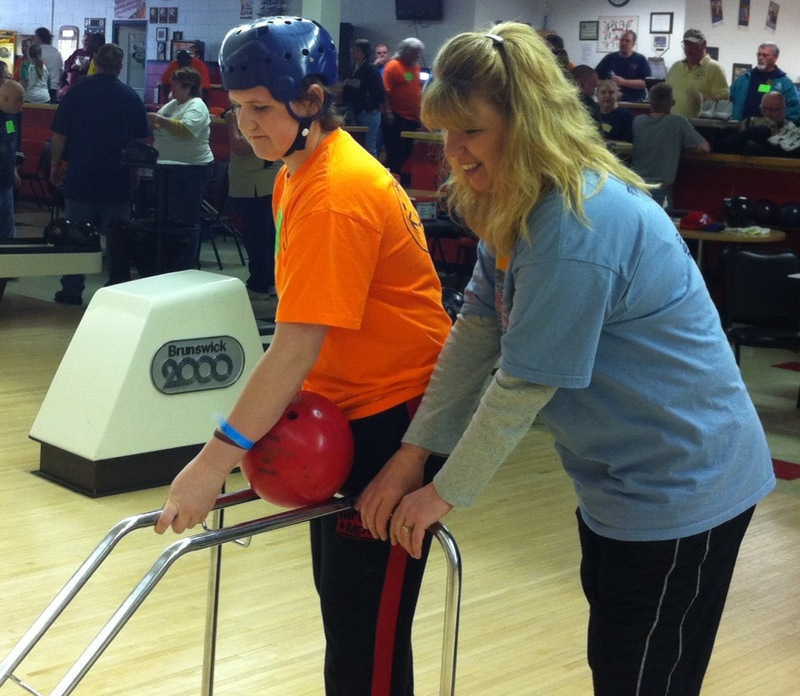 So, why did coach Webb pick Geno as a Unified Partner® for the Team Missouri bowling team? “The fact that she’s an officer, I thought it’d be great to have a volunteer officer on the team and how she gets along so well with all of the other bowlers,” Webb said. Geno said she wants to go to New Jersey so badly that she would have taken any spot on Team Missouri, regardless of the sport. The success of a program or organization can be defined in a multitude of ways. For the Laberer family of Union, you don’t have to look any further than their daughter, Michelle, to see that Special Olympics Missouri has been a huge success for them. “The thing that has meant to most to me is watching her at the dances and things. … In school they don’t get to do those things; she didn’t go to school dances or compete in school sports and with SOMO she does,” said her mother, Barbara. Michelle Laberer competes in flag football, aquatics, bowling, basketball and track and field. Michelle started participating in SOMO events at the age of 7, but it wasn’t until a few years later that her parents started taking her to events outside of the St. Louis Metro Area. In the beginning Michelle was timid at events and around others, but after some time, she really blossomed. Michelle graduated from Union High School in 2007 and now, at the age of 25, works at Sheltered Workshop in Washington, Mo., a not-for-profit that provides employment opportunities for people with physical, mental and developmental disabilities. For the past eight years, Michelle has worked on various tasks under her supervisor Betty Obermire who said Michelle has come a long way since the first day she walked through the door. She said Michelle is always on time and takes her work very seriously like any other regular job. For the Laberer family, SOMO is more than just a few sporting events every year. Just like SOMO offers sports during every month, Michelle takes full advantage of all of those opportunities, participating in swimming, bowling, basketball, track and field and flag football. Michelle appeared with St. Louis Rams player Robert Quinn on a billboard for SOMO this fall. Barbara said her oldest daughter, Rachel, has been volunteering for SOMO for many years. “She has been a Unified Partner with Michelle in bowling … she does the Polar Plunge and more,” Barbara said. With her mom’s guidance as a coach, Michelle has racked up the awards over the years, totaling more than 100 medals. In what may be the best ending to any story ever, Barbara said through SOMO Michelle has made many friends, but one boy in Moberly stands out from the rest. “Eight years ago she met a boy at a state bowling tournament and they are still dating,” she said. “We try to meet up once a month. “They’re talking about even getting married, which may just be a possibility. We’ve thought about adding on an apartment to our house because neither of them can really live on their own. Barbara said her favorite part of being a mother of a SOMO athlete and a coach is just seeing the athletes succeed. “You see someone get a strike, turn around, scream and throw their hands in the air … that’s awesome. Sarah Barr is SOMO’s marketing intern this summer. I have been around the Special Olympics organization for several years as a volunteer, coach, and now as an intern. My high school hosted a yearly soccer tournament, and after watching my first Special Olympics soccer game I was hooked. 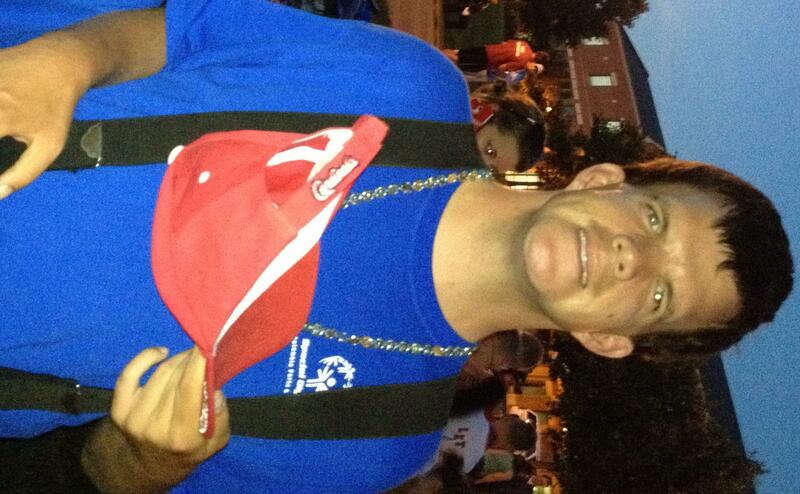 When I moved to Columbia to attend Mizzou, I joined the Central Area Special Olympics family. I coach basketball and track, and love every second. Now I’ll admit, I did not understand how important the State Summer Games were when I started coaching. I thought the athletes might view it as just another day of sports to pile atop their seemingly endless succession of practices and tournaments. However, one of the athletes on my track and basketball team showed me how incredibly wrong I was. Michael is a passionate athlete, an extremely thoughtful person, and even happens to have an insatiable interest in nature (example – he brought a plastic jar to every track practice to catch bugs). He is easily coached and always wanted to work harder, whether it meant scrimmaging after the other athletes (and admittedly, coaches) were tired or joining another team to do sprints. 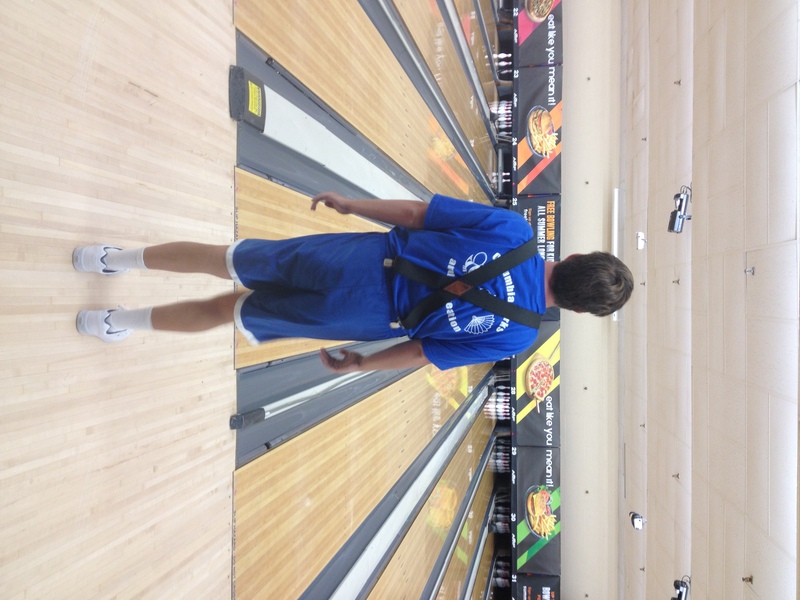 As great of a basketball player Michael is, his true passion lies in bowling. 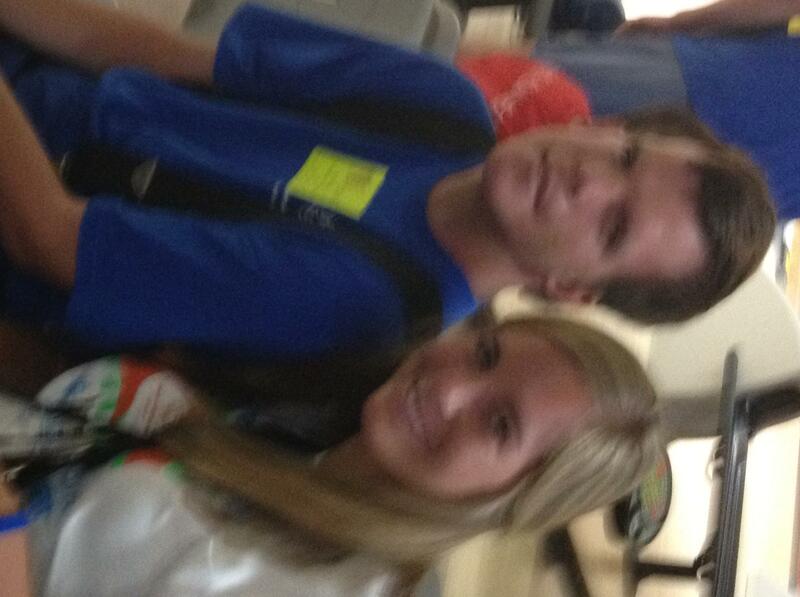 The bowling tournament Michael was so excited about turned out to be the determinant of who would go to State. I could not attend the tournament myself as it was in St. Joe and I am on a college student’s budget, so the following was recounted to me by an AMAZING woman from the Columbia Parks and Recreations agency, Jody Cook. Perhaps you have to know Michael personally, but this story gives me goosebumps. What an awesome moment! It showed me how important the State Summer Games were to the athletes. A few frames prior to winning! So, with that understanding, I headed to my home-away-from-home (Mizzou) to spend it with my other family (SOMO Athletes), and I was not disappointed. The athleticism, the laughter, the joy – I couldn’t turn around without seeing all three. The athletes worked hard and wore their accumulation of medals with immense pride. But the best moment at the State Summer Games for me, personally, was when I got to watch Michael bowl his way to a gold medal. He exuded pride. His feeling of accomplishment was mirrored by the other athletes around him, and their smiles were infectious. In fact, I am smiling as I type this just thinking about it! You have read about two very different roads to state – Michael’s story of gold medals and pride, and mine of life lessons. I encourage you all to pave your own road. I hope you have someone like Michael to call your friend, and if not, I encourage you to volunteer at a Special Olympics event soon! The State Summer Games are not just another tournament – they’re a celebration of the journey. Jennifer Price volunteered at the SOMO District Bowling Tournament at Southside Family Fun Center in St. Joseph March 3 & 4, 2012. It was a very humbling and amazing experience to meet all the athletes and see how their faces light up and how excited and determined they were to do their best despite their disability, whatever it may be. I was especially touched by the athlete pictured with me. Lage is an amazing young man who survived, against all odds, a very traumatic experience and was often referred to as a miracle. He was injured in the tornado that devastated Joplin last year. Lage was in a vehicle along with his grandmother and cousin sitting in the Home Depot parking lot when the tornado struck, leaving him severly injured. He was found among the rubble and devastation of the Home Depot store next to his grandfather’s truck. The tornado had relocated the truck from the parking lot to what once was the Home Depot store. Lage is a terrific, determined young man and obviously a fighter. He has overcome so much already, defying the odds as he continues to heal. He does all of this and continues to have a big heart and with a smile on his face. People like Lage are an inspiration and should remind us all to be thankful and thoughtful for those around us and what they have to offer.